I finally got back into playing Mass Effect after a year-long break. I looked at the default Mass Effect profile and I wasn’t happy. 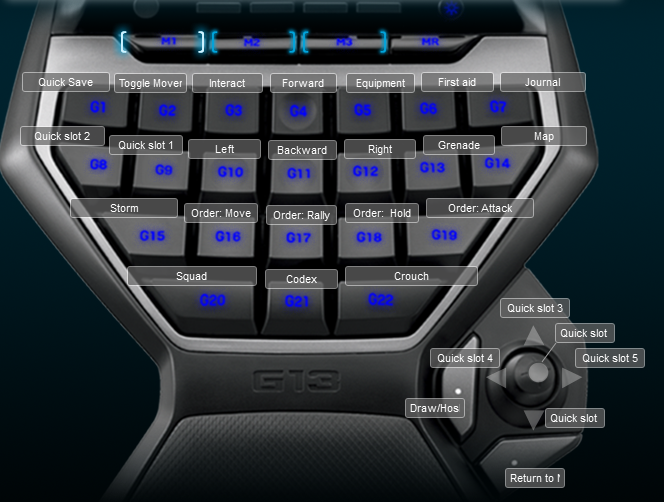 I created my own custom Logitech G13 profile for the game. It was the typical cluttered mess that made about as much sense as a monkey throwing darts at a wall. I updated the keys to use the keystroke instead of multi key. I rearranged to keys to better suit my needs. I went with my typical layout and put the orders on the joystick. The gun buttons are in an odd place, usually I don’t access those keys much and I planned to just use the mouse wheel to switch weapons. I wasn’t sure what to do with the quick key buttons and in the end I left them out of the profile. Below is a screenshot of my keyboard layout.